Check the "Sync Source" and zero cross filter (frequency filter) settings. 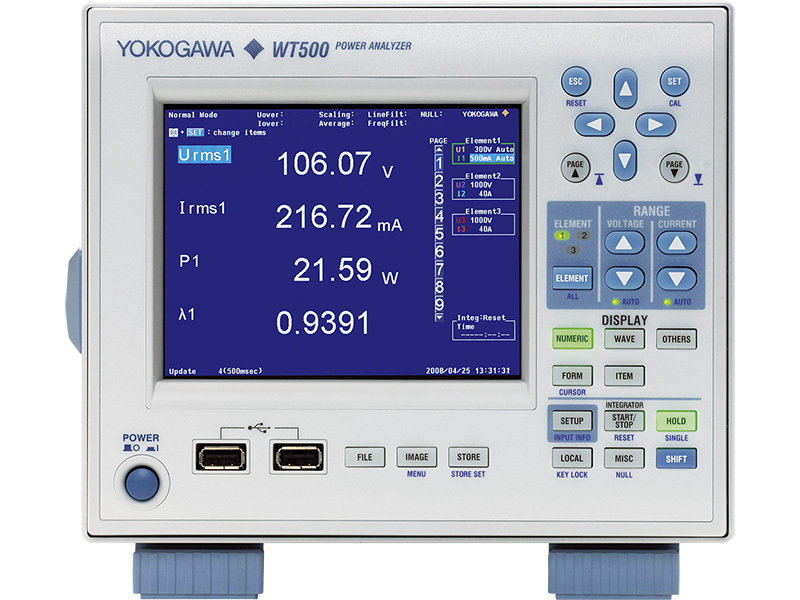 For the WT3000, "Sync Source" setting is irrelevant if the data update rate is 250 ms, 500 ms, 1 s, or 2 s.
In principle, if the AC signal is is not averaged over an interval synchronized with the cycle of the signal, a correct measurement cannot be obtained. For the applicable models listed above, the synchronous source determines the interval at which the cycle of the signal is detected and calculated. You should make a determination from the voltage and current waveforms as to whether to set the "Sync Source" to voltage or current. Detection of the input waveform's period is made using a comparator (zero cross detector) referencing the center of the waveform's amplitude. Be sure to select a waveform for the "Sync Source" that: is nearly sinusoidal, has little harmonic distortion, and that has minimal jitter around the zero cross point (center of the waveform amplitude). For example, with inverter motors and other such devices, current should be used since it is closer to sinusoidal than voltage which is a PWM waveform, but for commercial frequencies the voltage signal is often an ideal sine wave, so you should select voltage. For inverters and other such devices, harmonic components are also included in the current, and sometimes the period cannot be detected accurately. In such cases, set the zero cross filter. The zero cross filter (frequency filter) rejects components equal to or higher than the cutoff frequency, resulting in accurate period detection. The filter cutoff frequency for the WT210, 230, 1600, and PZ4000 is 500 Hz. For frequency measurement, check whether the fundamental wave of the item set to the sync source can be accurately measured.